Showing results for tags 'Evil'. What's wrong Shining Armor honey...? "You have another headache...? Oh you poor dear. 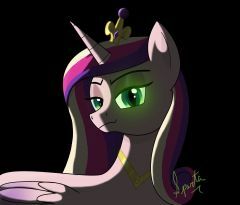 I'll help you with that..." Horray for evil Cadance/Crysalis! I havent drawn Cadance in FOREVER and I was in the mood to draw her! I will never upload my first time drawing her since Im extremely embarrased of it. xD Anywho! 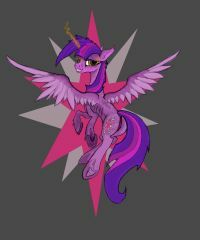 I decided to go with Crysalis!Cadance since her eyes are so freaky! Simpliest background drawn ever to further enhance the evilness! © Cadance/Chysalis belong to Hasbro. Art is mine! This is Nightmare Solar Flane which I drew. 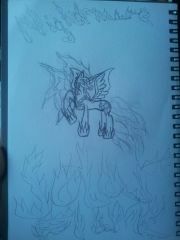 She is the evil celestia like nightmare moon and luna. This is of my own creation not copied I only went on google images too look at a few colour schemes. I must add please do not think Nightmare Moon and Solar Flame shoure work together because it doesn't work with eternal night and then eternal day hehe. Anyway enjoy! I just joined a storyline as one of my characters. And he is downright the most despicable character I have made up, and i hate myself now! Sure he is interesting, but playing tic-tac-toe with a dagger on a living specimen even creeps me out! And I am willingly writing this! I came up with it naturally! I just feel so bad about what sort of person I am! Any moral support would be appreciated right now. I can't stand myself! So, after the finale I've had a thought tugging at the edge of my mind that finally took form today. After Queen Chrysalis defeated Celestia, the Mane 6 were told to fetch the Elements of Harmony to defeat the changeling horde. Obviously they failed to retrieve them and Cadence/Shining Armor took over from that point, but I thought about how the Elements were used previously: they returned Luna to her normal form, and restored Discord's stasis. In that manner, they restored what was previously the norm, or fixed anomalies in Equestria as it were. How then would the Elements have worked against Chrysalis and the changelings? Would they have driven them out of Canterlot to restore "order?" If so, who decides what order or the norm in Equestria is anyway? The Elements themselves? I believe it's been said that the Elements predate Celestia and Luna, and Celestia herself stated that they won't work for her or her sister anymore. This brings in a thought of some form of autonomous thought. Why have the effects of the Elements always run congruently with Celestia's wishes or thoughts, despite her not wielding them anymore? The changelings are part of Equestria, just as the ponies are. Nightmare Moon was admittedly an aberration, and I suppose Discord could be called the same, though I'm doubtful on that explanation, but Chrysalis and her subjects weren't (in my opinion). Overall, why is the dominance of ponies upheld by objects that are supposedly intended to uphold balance? Can somepony do a Hipster Aura for me? Found this fun little thead somewhere else and think this might be an awesome discussion anywhere! If your character (or your favourite Canon character, whichever) have an Evil twin / clone. What would that pony be like? And if you already have an Evil pony, what would be the good one be like?